On looking at the way the search eco system and Internet marketing is heralding, the trends discussed below demonstrate what you can can expect for 2016. Read on and starting preparing now. This year, a number of significant SEO trends are anticipated to introduce and shape the whole behavior as well as the search eco system of the world. Mobify reveals that 1.2 billion people access the web through their mobile phone devices. Given the background statistics, it isn’t too difficult to understand that the number of mobile searches are likely to increase in 2016. Increasing number of people purchasing hand-held devices, like android based smart phones, to choose, compare and purchase their products online. This indicates that businesses have to prepare their website to adapt for hand-held devices. When you have to promote the value of your brand actively on the Internet. Therefore, having an optimized presence for mobile media is essentially crucial for companies looking to stay ahead in the game. Given that mobile usage is set to outpace desktop, you need to ensure that everything from your custom logo design to your website and your social media pages to your display ads are all mobile optimized. Searchengineland.com reveals that Google Now, Windows Cortana and Apple Siri are replacing the conventional text based search system. Your audience or users are still searching online, but now they are presumably taking the assistance of voice based searches. This is sure to change the dynamics of the search eco system. Hence, businesses looking to get rank higher and increase their visibility in the search engine result pages will need to improve their social SEO techniques. To achieve proper results and value you will need to work on some of the most significant factors that are often ignored by businesses such as offering training to your existing manpower vs letting them learn through trial and error. Unethical and negative practices don’t yield results and if you don’t avoid such practices it may get your website penalized by search engines. Brainshark.com reveals that 74% of internet traffic in 2017 will be video. The site further reveals that 52% of marketing professionals worldwide name video as the type of content with the best ROI. No wonder an ever increasing number of B2B marketers favoring video over the static text formats as a part of their content marketing initiatives. Video content marketing has turned out to be a mainstream activity for the B2B space. Videos are the best way to build links back to your site. If your audiences find your video helpful, they’re likely to share it, therefore facilitating linking for your site. Remember, the more your videos are share, better your overall online presence will be. From 2016 and forward, deep links will begin carrying more meaning, similar to deep links at the web. Deep links are the links that point towards a section of a particular map or a specific page. Deep linking helps reduce the bounce rate and improves the page views and average time spent on a site. Searchenginejournal.com suggests that deep linking can raise the authority of a site and improve the overall visibility and relevancy of a site dramatically. For a very long time, SEO experts and marketers have mistaken content curation for content aggregation. In their endeavor to consume content, they’ve pulled content directly from sources, without thinking about the repercussions. There are a range of content aggregation challenges that make the entire process difficult and daunting, but things are changing at a dramatic pace. In fact, SEO experts believe that in the coming years, content curation is likely to replace content aggregation completely. It comes as no surprise since content curation helps you build relationships with different high-value sources to maximize your reach and value. It makes it easy for you to create one more digital asset to your personal brand, to offer your visitors another way to subscribe, and to allow your community to follow third party contributions. The importance of local SEO is now being recognized more prevalently, making many entrepreneurs concentrate on their local strategy. To stay ahead in the game, pay attention to the local tangent in your inbound marketing campaign. Make sure to list your business on popular online business directories to increase your local awareness. Clean up your citation data (NAP – Name, Address and Phone) directory and add local terms in the content on your site. Last but not least, do ask your visitors and buyers to review your site or business. Reviews remain popular with both popular search engines and with customers. 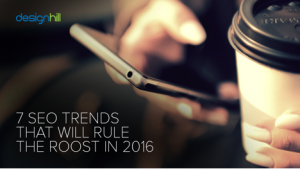 So there you have it, SEO trends that are likely to remain prominent in 2016. We’re sure more awesomeness will come to the search eco system. Cheers to more exciting SEO trends! May we see bigger, better things from 2016! Are there other SEO trends you think will big in 2016?